For those empowered, independent and career oriented women out there who wants to have an E-book copy of Suze Orman's WOMEN & MONEY (Owning the Power to Control Your Destiny), you could leave me a message here then include your email address so I could send you a copy. 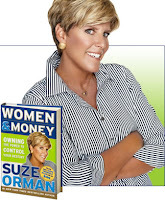 Don't worry this is free of charge =D Suze Orman is an internationally acclaimed personal finance expert. So, what do you have to lose in reading her book? The E-book is in PDF format so better to have an Acrobat Reader install in your PCs and laptop.